Hedge funds are typically seen as places where only the wealthy put their money, and this is a correct assumption. You need to have a net worth of over $1 million to legally be allowed to invest in a hedge fund, and this excludes the vast majority of us. However, just because we can’t invest our cash into a hedge fund does not mean that we cannot take a similar approach to trading with our own personal cash. First, let’s look at what makes a hedge fund special. Hedge funds are private funds. They are designed to make cash in any type of market. And they often take unconventional approaches to make this happen. These funds can be comprised of stocks, but they are not limited to them. A lot of managers focus on currencies and commodities, too. Some focus solely on these things. The legal restrictions on these funds are much less because of the high barriers for entry into them. When you’re trading your own money, though, you don’t need to worry about restrictions on funds since you are trading your own money and not that within a fund. 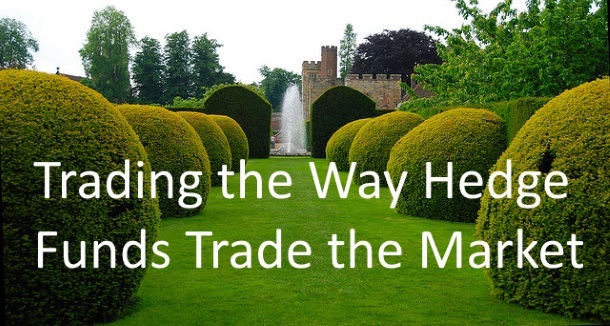 By looking at the methods and assets that a hedge fund uses, and then modeling your own trading after this, you can get the benefits of a hedge fund, but on a smaller scale. You will need to use some creativity, though, because for many people, the exact methods just won’t be beneficial because of the cash on hand differences. A big fund worth a billion dollars can easily afford a margin account a sell shares of a stock short, but you might not have the minimum $25,000 in your account after making your trade. Other methods will be needed to do this, such as trading with binary options instead of within the traditional stock market. If you want to mix different types of assets with your trading, this is easy too. You can trade with a stockbroker and a Forex broker if you wish, or you can combine all of your trading on a single broker if you go through a binary broker. Either way is fine and can be profitable for you, it just depends on what your budget restraints are and how the levels of convenience affect you. Some people prefer doing their trading all in one spot, others like the separation amongst their assets. Also, you may find that some brokers have better rates than others. One broker might have a spread of 5 pips on the pairs you trade while another has 4 pips. Smaller spreads equal bigger profits over time. And with binaries, one broker might have a rate of return of 81 percent on your favorite asset while another has a rate of 78 percent. It’s just 3 percent, but at $100 per trade, that’s $3 difference each time. Make 1,000 trades a year, and that’s $3,000 difference that you are losing out on. Growing your cash is important, and when you take on a hedge fund mentality, you can grow your money your own way with fewer self-imposed restrictions on what you do. It’s a freeing thought, and if it works for you, then it’s something that you should consider. You are in the markets to make money, and you shouldn’t let one type of trading or one school of thought limit what you’re capable of if you don’t need to. There are many opportunities and things like binary options can make these methods a lot more accessible, even if you don’t have $1 million to your name. Hedge funds often carry prestige with them, but that doesn’t mean that only the super rich can benefit from their strategies.